One handy feature in Grow is the ability to use spreadsheet functions to organize your data. While the functions in Grow have some similarities to Excel functions, there are some differences. If Excel or Google Docs is a full powered spreadsheet, Grow is more a "spreadsheet-lite" version. This article has two sections, one to explain the functions Grow has and how to use them, and the second to walk you through referencing other reports within those functions. You can add a spreadsheet by clicking on the small arrow by "Add Report" on the right side of the Edit Metric screen. You can only add one spreadsheet per metric. You can also add it by clicking "Add Report" and searching for "Spreadsheet Functions" in the list of data sources. The following section will explain how to use each function or operator in Grow and how they compare to Excel. Given that this list is extensive, if you are looking for a specific function or operator, we recommend using Ctrl+F to search for it. How to use it: Returns the sum of a series of numbers and/or cells. Excel Comparison: =SUM function adds a range of numbers/cells. What it does: Returns the product of a series of numbers and/or cells. Excel Comparison: =PRODUCT function multiplies a range of numbers/cells. What it does: Returns the average of a series of numbers and/or cells. What it does: Returns the count of a range based on a condition you specify. Grow Example: =COUNTIFS(report2!A, "Esther", report2!C, "5") --> This will count the number of times the value in Column A is "Esther" AND the value in Column C is "5"
What it does: Returns the sum of a range based on a condition that you specify. What it does: Returns the sum of a range depending on multiple criteria. Excel Comparison: =SUMIFS functions adds the cells in a range that meet multiple criteria. What it does: Each operator can be used with any of the functions listed above. They will return a single numerical value based on what the operator does. Excel Comparison: + (plus sign) operator performs addition. - (minus sign) performs subtraction or negation. * (asterisk) performs multiplication). / (forward slash) performs division. Excel Comparison: =IF function does something if a cell is true and something else if it is false. One note with IMPORTSERIES: be sure that you are not importing multiples series into the same column. The first series will pull in the column for that series and overwrite anything that is below it. Excel Comparison: =TRANSPOSE function transposes the selected cells into a row or column. What it does: Returns the last value in the selected range. What it does: Returns the first value in the selected range. What it does: Returns a substring from the beginning of a specified string. Excel Comparison: =LEFT function returns the first character(s) in a text string, based on number of characters you specify. What it does: Returns a substring from the end of a specified string. Excel Comparison: Returns the rightmost characters in a text string, based on the number of characters you specify. What it does: Rounds the number to the specified number of places. You can use zero to round to the nearest whole number. Excel Comparison: =ROUND function rounds a number to a specified number of digits. What it does: Returns a segment of a string. Excel Comparison: =MID function returns a specific number of characters from a text string starting where you specify. The syntax is =FUNCTION(report!location), where the function is the expression, the report is where you want to pull it from, and location is the column or cell that you want to reference. The report numbers are listed above your data, but below the metric visual. (You can see this in the example below.) When referencing a report, you will write report#! It is always followed by an exclamation mark. For example, you will reference report1! or report2! or report3!, etc. based on the reports you have. Previously, to reference the Master SQL report, you would enter masterreport. Now, to reference the Master SQL report or Joined reports, use the corresponding report1! or report2!, etc. If you are referencing a cell or column from spreadsheet functions, use spreadsheet! In the location field, you can reference a specific cell or a column in a report. This location always comes immediately after the exclamation mark denoting which report is being referenced. Please note that you cannot reference spreadsheet data anywhere outside of spreadsheet functions. This includes joined reports or master reports. Spreadsheet data can only be referenced as spreadsheet!A1 inside spreadsheet functions. =SUM(spreadsheet!A1, B1) This example would return the same figure as the example directly above it. Additionally, we will use the following Google Analytics example. The metric is the Visitor Overview prebuilt metric. It has two Google Analytics reports and a Master SQL report. Let’s say we want to pull column B from Report 1 into our spreadsheet. First, go to the Spreadsheet Functions tab. You can give the column a title, if you want. Hit enter, and watch your data pull in to your spreadsheet. Next, we’re going to reference something from Report 2. Again, you can label the cell if you want. We are going to pull cell D2 from report 2. This will return the value that is in Report 2, cell D2. 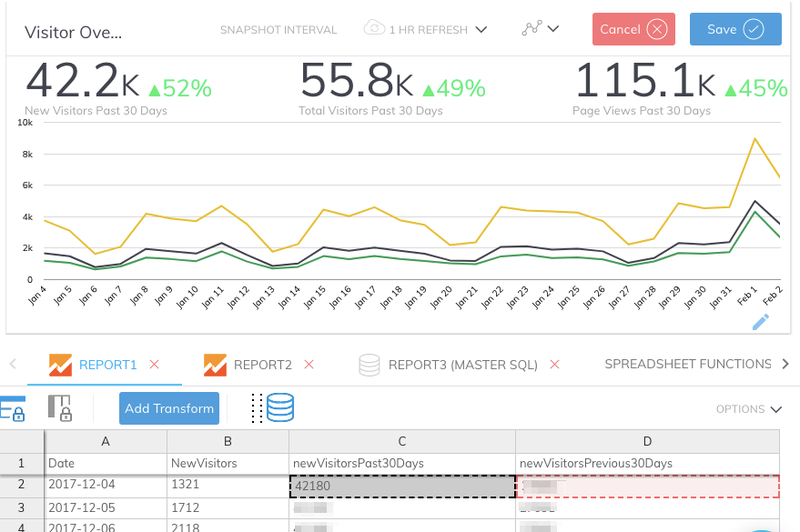 For the Master SQL report, we will pull in column D, which, in our metric, is Total Pageviews. Press enter, and the column will fill in to your spreadsheet.